A recycled metal mockingbird wackily waves its wings atop Fred Conlon's irreverent garden stake. Northern Mockingbirds sing almost non-stop, imitating other birds' calls while taunting them by flashing the bright white patches under their wings. The rowdy performances of these feathered clowns are all about defending their turf. Fred Conlon expresses his wacky, irreverent sense of humor in this sculptural portrait of the bird that loves to vex other birds. 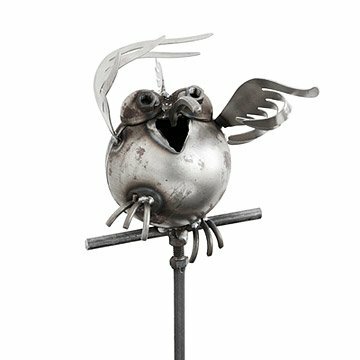 Plant this handmade, recycled metal mocking bird stake in your garden, and its wild gaze will command your turf and demand everyone's attention.